For the past six weeks I’ve been gloriously shopping at the local farm stands and I can’t wait for the open-air Farmer’s Market to start! I have been experimenting with various locally grown baby vegetables for weeks now and my favorite recipe so far is for Spring Lamb Stew. What comes to mind when many people think about lamb stew is a rich hearty broth that has been braising in the oven for hours but that just isn’t necessary. Lamb stew doesn’t need to be reserved for cold winter months. 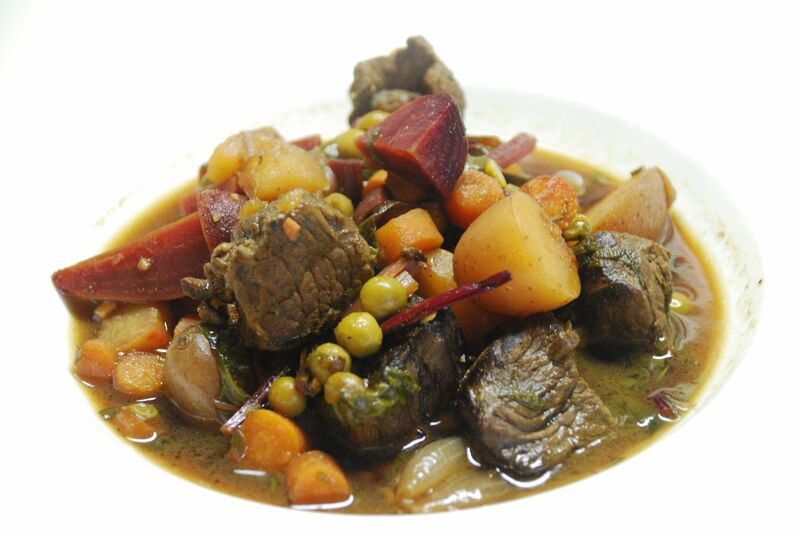 For this recipe I utilize the fresh spring crop vegetables and tender chunks of lamb leg meat to create a light, fresh flavored stew. NOTE ABOUT CUTS OF LAMB: I tried various cuts of lamb for this recipe – shoulder, neck, and boneless leg. Although less expensive, I found the shoulder and neck cuts gamier in flavor. I generally like lamb leg meat cooked medium to medium rare but for this stew the cut allowed me to cook the stew quickly (about 45 minutes to brown meat and I used par cooked veggies) and still produce tender chunks of meat. * A red wine will develop into a richer flavor in this stew but stay with a light red. I used a light Rioja for this recipe. White wine can also be used and will develop into a very light fresh taste that enhances the sweetness of the vegetables. Again, stick to a light white. I’ve use a light Pinot Grigio in the past. 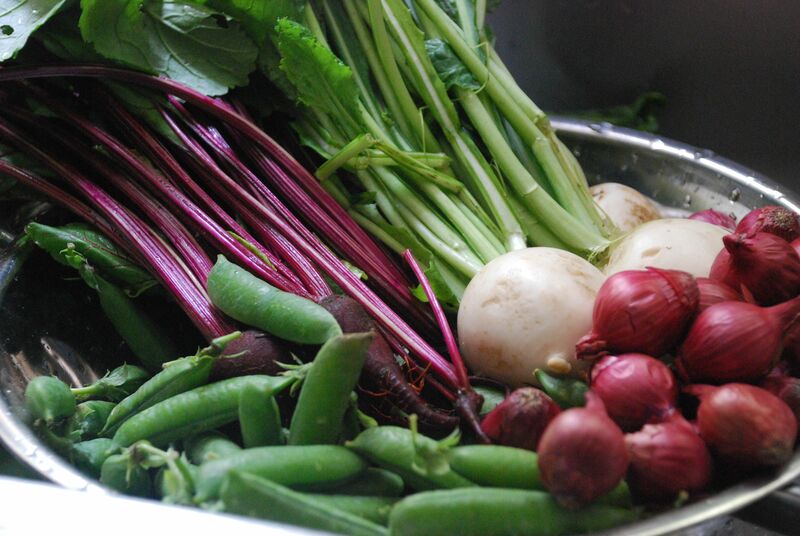 PAR COOK VEGGIES: Bring a large pot water to a boil. 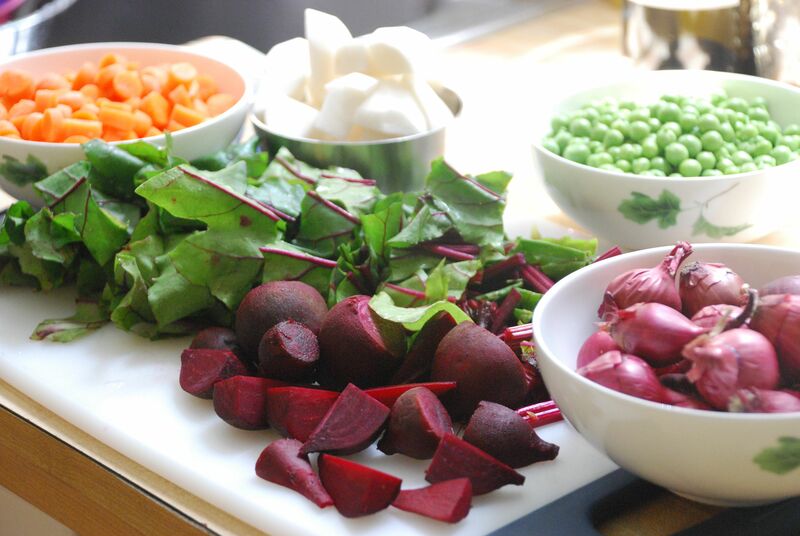 Assess which vegetables bleed in color (like beets) or have a strong flavor (like pearl onions). Cook the vegetable that bleeds in color second to last and the pearl onions last. Par cook vegetables separately in hot water, lifting vegetables out with a slotted spoon when cooked and cooking the next vegetable. For example, using the vegetables noted in the chart above: Cook turnips for 3 minutes then remove with slotted spoon. Let water return to boil and cook carrots for 3 minutes. 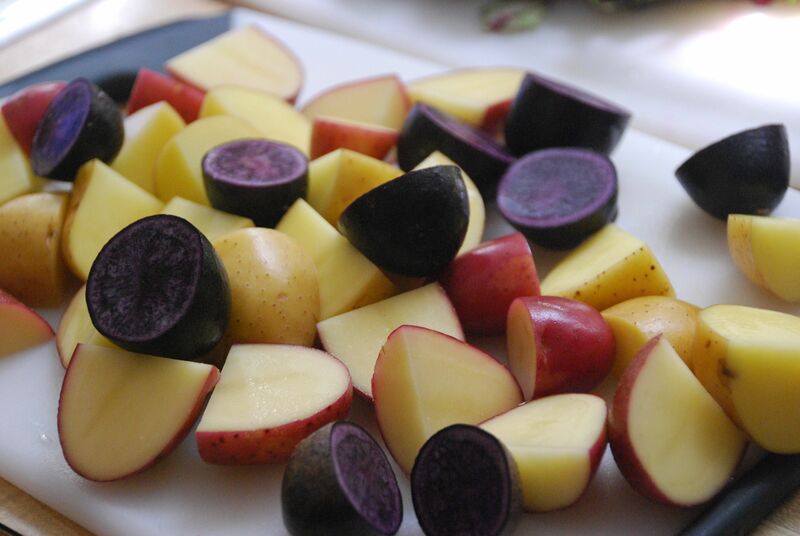 Remove with slotted spoon and put beets in water when it returns to a boil and cook for 5 minutes. Last, place pearl onions in water for 30 seconds (no more or they will get too soft). Just the pearl onions need to be rinsed in cold water or placed in an ice water bath. Peel outer skin of the onion by cutting the ends and pinching the center of the onion out. 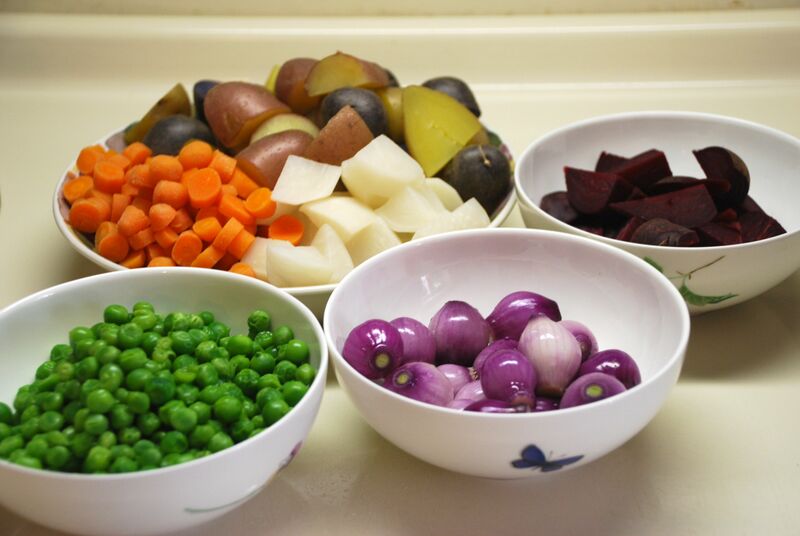 The vegetables can be prepared to this point in advance and set aside until ready to cook stew. PREPARE STEW: Heat 2 Tbls. oil in a heavy saucepan. Brown the lamb on high heat. If necessary, brown the meat in 2-3 batches so each piece browns nicely. When all the meat is browned, return the meat to the pan and add pearl onions. Lower heat to medium-high and saute for 2-3 minutes. Add wine and continue stirring for 1 minute. Add all the vegetables (except the beet greens), rosemary and sage. Stir until everything is mixed evenly. Add chicken broth and bring to a full boil. Boil uncovered for 8 minutes. Add beet greens and cook for another 2-3 minutes. Serve as a one-pot-meal or with a nice crusty bread. 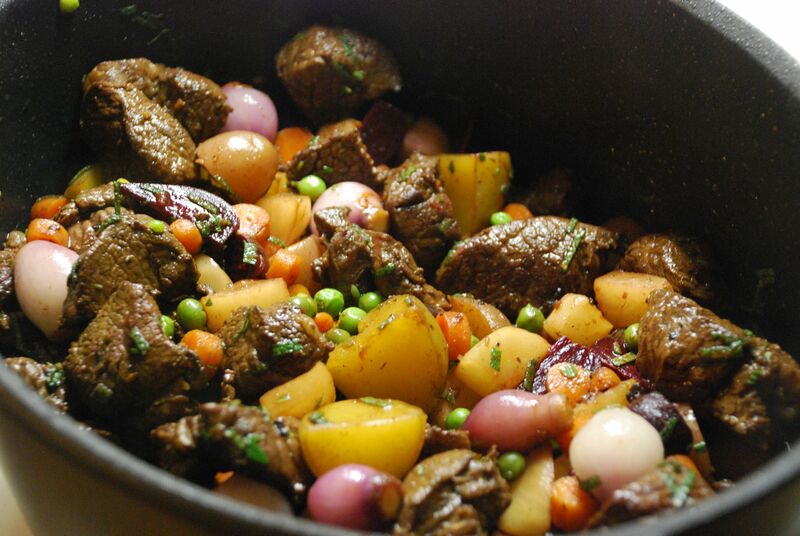 You are currently reading Spring Lamb Stew at Hestina's Kardia.